IGMPI is conferred with QCI - D. L. Shah Quality Award for an initiative for knowledge dissemination & training in the area of good manufacturing practices (GMP) by Dr. R. P. Singh (Secretary general, QCI) and Mr. Hari K. Taneja (Trustee, D.L.Shah Trust) in 10th National Quality Conclave held on August 7-8, at Sirifort Auditorium, New Delhi. 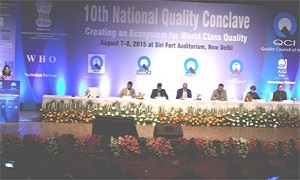 The Annual Flagship event of QCI, the 10th National Quality Conclave "Creating an Ecosystem for World Class Quality in India" with World Health Organization (as Technical Partner for Health Thematic Session) and ASQ (as the Knowledge Partner) held on August 7-8, 2015 in New Delhi. The Quality Conclave 2015 is a platform to know what the world has done and how India can build an Ecosystem of Quality in every sphere of life. IGMPI is moving hand in hand with technology advances and has gained recognition as global training provider for Pharmaceutical, Food and healthcare professionals in the areas of GMP, Quality Assurance and Control, Regulatory Affairs, IPR and Good Laboratory Practice, Medical Device Management and Product Management, Clinical Research, Pharmacovigilance, Medical Writing, Drug and Discovery and Development, Public Health and Hospital Management, Medical Coding, Pharmaceutical Nanotechnology, Pharma Sales and Marketing Management, Food Safety, Food Processing and Preservative, Organic Farming, Food Safety in Hospitality Industry, HACCP and GAP. This conclave marked the presence of Mr Amitabh Kant (Secretary, Department of Industrial Policy and Promotion) as the guest of honors. 1200 delegates along with 15 International speakers contributed their efforts to make this event a grand success. The award being conferred by CEO, QCI Mr C. K. Biswas and Advisor, QCI Mr Avik Mitra to the Executive Director Mr Syed S. Abbas, Chief Advisor Dr Mahesh Gupta and Director Rafat Abedi from IGMPI. Event commenced with the National Anthem, Welcome of dignitaries and guests, Lighting of the lamp, Welcome address by Mr R. Mukundan (Chairman NBQP), Mr Adil Zainulbhai (Chairman QCI), Mr Amitabh Kant (Secretary DIPP) and special address by Edward Kelly (WHO Representative to India). Distribution of QCI - D. L. Shah Award commenced with the address of Mr Amitabh Kant (Secretary, Department of Industrial Policy and Promotion) in various fields. Session came to an end with the concluding remarks and vote of thanks by Dr R.P Singh, Secretary General, QCI. Plenary sessions by eminent professionals from various fields furnished value addition to this event. There were two such sessions: Plenary session I by Mr R C Bhargava (Chairman MSIL), Dr Phyllida Travis (Director, Health Systems Development, WHO SEARO), Mr Thomas Votsmeier (Head Personnel Certification Body, DGQ) and Mr Adil Zainulbhai (Chairman,QCI). Plenary session II by Mr Nigel Croft (Chairman ISO TC 176/SC 2) , Mr Paul Grizzell (President, Core Values Partners, USA) , Dr R K Tyagi (President Designate, Aero Society of India, Ex-CMD HAL). Apart from these there were 3 concurrent sessions. At last but not the least case studies were presented by Session Chair- Mr Hari Taneja / DL Shah Trustees DL Shah Quality Award Winning Case Studies (Best 5). The event ended with the valedictory session taken up by Mr. R C Bhargava, Chairman, MSIL and Dr. Devi Shetty, Chairman, Narayana Group of Hospitals. 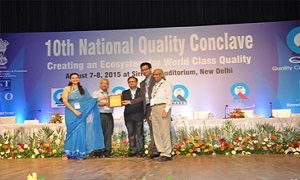 Event like National Quality Conclave bestows us with the platform which provides an immense opportunity to interact with some of the best International Experts to bring in quality and an opportunity to build relations with Industry/ Services/Academia and work towards competitiveness as "Quality is never an accident rather it is always the result of commitment to excellence, intelligent planning and focused team effort".